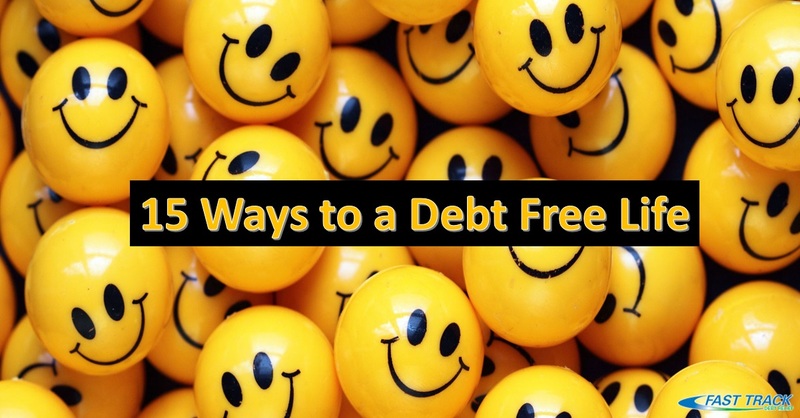 Here are 15 easy habits to help you achieve a debt free life. Focus on each until it becomes habit, then move on to the next. Make a workspace devoted to handling your budget and paying bills. If the act of managing your debt is physical as well as mental, it's that much easier to make it a habit. Make a budget. Identify luxuries, and cut extraneous spending. Pay with cash as often as possible. It forces you to live within your means, rather than relying on credit. Don't hide from your debt. Keep a calendar of payments. Debt relief can be like exercise – the more often you practice it, the more you want to accomplish. Cancel the cable or satellite TV. Get a streaming service like Netflix. A monthly fee of $9 is cheaper than rates that climb upward of $100. Skip the gym. A membership you never use is a waste of money. Run, do push-ups, find training videos online for free. Take advantage of free local events. Working toward a debt free life doesn't mean you need to be a homebody. If you have a late fee or can't pay a full monthly payment, don’t ignore it. Call the company as soon as possible to see if they have short-term options to help. When managing family finances, look up scholarships and financial aid programs. There's more out there than you'd think. Avoid traffic fines and parking tickets. How? Drive, and park, responsibly! Carpool, and fill up when you pass lower-priced gas stations. Get back into nature. Being in debt is stressful; while being in nature won't take the debt away, it can take the stress away. A day at the beach or forest is free therapy. Shop at the dollar store. Stock up on cheap snacks, cleaning supplies, toiletries, and school supplies. Do you have old CDs, DVDs, baseball cards, or collectibles? Take them into a store that resells used items. 50 old CDs you never listen to can turn into an extra $100. Celebrate (inexpensively!) each debt paid off. Acknowledge the progress you've made. Debt relief programs can help you with these milestones. Are you ready to get on the fast track to get out of debt?